§ B-1 Location and composition of district. § B-2 Preservation goals for the Bluff Road Historic District. § B-3 Summary of work that is exempt from review. § B-4 Guidelines for site planning. § B-5 Guidelines for historic houses. § B-6 Guidelines for non-historic houses. § B-7 Guidelines for new construction. § B-9 Guidelines for relocation. § B-10 Guidelines when designation is limited to an access strip. § B-11 Guidelines for public property. The fourteen summer cottages constructed between 1892 and 1915 strung out along the top of the bluff overlooking the dunes and the Atlantic Ocean establish the essential character of the Bluff Road Historic District. These fourteen historic houses of Amagansetts summer colony share a similar modest size and an informal and unpretentious design. They share many features of the Shingle style including an overall picturesque composition, irregular roof lines, verandas and upper-story porches often incorporated into the volume of the house and wood shingle siding. These similarities gave the historic district a consistent architectural character. The relationship of these summer cottages to each other and to the Atlantic Ocean is a defining feature of the historic district. All the summer cottages face south with windows and porches opening to the ocean view and breezes. Houses at the east end of the district are on a flat plateau on top of the bluff overlooking the ocean. These houses share the same setbacks on lots of similar width, establishing a regular rhythm and a village scale. The houses at the west end of the district are set on the dune crest, evoking their direct relationship to the Atlantic Ocean. The 100 acre double dune area south of Bluff Road retains the open, natural appearance it had when the cottages were built. Bluff Road retains its rural character with informal edges and natural vegetation. This intact setting preserves the relationship between the cottages and the ocean and is one of the strongest unifying features of the Bluff Road Historic District. Within the historic district are four public buildings which are associated with the Naval Direction-Finding Station which operated here from 1921 until 1946. Because of the attempt to camouflage these buildings by giving them a residential appearance they are compatible with the character of the historic district. The Bluff Road Historic District Designation Proposal further describes the individual properties and the character of the historic district. Maintain the architectural integrity of the historic houses, especially of the front facades and other components visible from the road. Allow additions and other changes to rear facades and in appropriate ways to side facades to allow the historic houses to be adapted to changing needs and lifestyles. Maintain the features of each property that contribute to the setting; the siting of the houses; open front yards; and low fences. Retain other features of the setting that maintain the relationship of the houses to the Atlantic Ocean including the rural character of Bluff Road and the open dune area. Enhance the setting by encouraging restoration of views from Bluff Road across the dunes to the ocean. Protect the character of Bluff Road by requiring that new construction or redevelopment of "non-historic" properties be compatible with the character of the district established by the historic houses. Maintain the architectural integrity of public buildings of historic significance, maintain the features of public property that contribute to the setting of the historic district, and require that any changes to public property be compatible with the character of the historic district. Installing a new roof coverning of wood shingles, asphalt shingles or fiber cement shingles that accurately replicate the appearance wood shingles. Any resurfacing of a flat roof (slope of less than 3 in 12). Replacing wood shingles on side walls with new shingles of the same material, texture and coursing. Painting an existing painted surface. Application of a clear wood preservative on wood shingle siding. Repair or replacement-in-kind of porch steps, porch flooring and railings to porch steps. Any work in the backyard except an addition to the residence. Installing a post-and-rail fence with two rails. Doorway and porch lanterns and landscape lighting with 100 watt or less incandescent bulbs located and shielded so that no glare and no direct light extends beyond the property line. Any minor repair where the purpose of the repair is to correct deterioration of a feature and to restore that feature to its original condition. All work listed above that is exempt for an historic house. Any work to the house itself which does not require a building permit. Work in the back yard of a residence is exempt from review. All work in the back yard of a residence is exempt from review except for an addition to the residence. 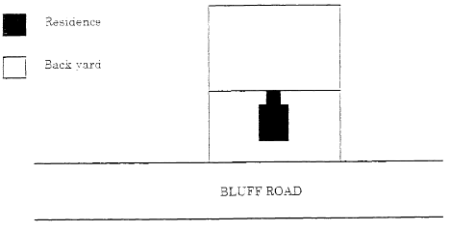 The intent is to retain the rural character of Bluff Road and the relationship between the houses and the road by approving appropriate low fences along the road boundary. Four properties have post-and-rail fences with two rails. This type of fence contributes to an open and rural setting and is appropriate for this district. The Board recognizes that fencing for deer is a concern on Bluff Road. The wire fence on the inside of the privet hedge and the simple picket driveway gate at 298 Bluff Road is an example of appropriate deer fencing for this district. Any fence along the front property line should contribute to an open and rural setting. Installing a post-and-rail fence with two rails is exempt from review. The natural topography of the bluff and dunes enhances the setting of the summer cottages and is an important feature of the Bluff Road Historic District. The houses at the east end of the district are on a flat plateau on top of the bluff and those at the west end are often sited at the crest of the dune. Each house is sited to have a direct and open relationship to Bluff Road and to the Atlantic Ocean. Changing the grade and installing berms or retaining walls can affect the setting of the houses, their relationship with Bluff Road, their relationship to the ocean vista and the sense of the natural topography. Changing the grade so as to alter the natural topography or to alter the dune or bluff setting of a property is not appropriate in the historic district. Berms and retaining walls along the front property line or in the front yard are not appropriate in the historic district. The intent is to encourage driveways which contribute to the rural character of Bluff Road. Driveways on Bluff Road are sited to have a minimal impact on the setting of the historic houses. Most are narrow driveways along the side property line with parking areas to the rear of the house. Only one property has a small parking area in the front yard. A plan to install a new driveway or alter the width or location of an existing driveway will be reviewed for its impact on the setting of the historic district. Semi-circular driveways or parking areas that would encroach on the front lawn are not appropriate in the historic district. Any resurfacing of an existing driveway is exempt from review. A tennis court, swimming pool, deck or terrace and associated fencing located in the back yard is exempt from review. The most appropriate fencing would not extend forward of the rear wall of the house. To the extent that fencing extends forward of the back yard, it is not exempt from review. Swimming pools and tennis courts should be located to the rear of the residence. If the configuration of a lot does not allow a swimming pool in the back yard, the Board will consider the impact of the pool or tennis court at the proposed location on the setting of the properties in the district. A pool or tennis court should not be located in the front yard of any property in the district. Decks and terraces will be reviewed for their location and impact on the setting and architectural integrity of an historic house and the setting of other properties in the district. Lighting should be consistent with the residential character of Bluff Road. Lighting of one property should not impact an adjacent property. Exterior lighting can affect the setting of an historic building, neighboring buildings, and the district in general. Existing lighting is primarily confined to incandescent fixtures at entrances and porches. Light fixtures should be appropriate to the residential character of the district. Light fixtures should be located and shielded so that no glare and no direct light extends beyond the property line. Fixtures should use incandescent bulbs (100 watts maximum). Doorway and porch lanterns and landscape lighting, which meet the above guideline, are exempt from review. Work to the rear wall that does not require a building permit is exempt from review. Any work to the rear wall of a house that does not require a building permit is exempt from review. Wall material. All fourteen historic houses in the district have natural (not painted or stained) wood shingle siding. This consistent wall material makes a major contribution to the cohesive character of the Bluff Road Historic District. Historic houses with wood shingle walls should retain this treatment. Replacing wood shingles with new shingles of the same material, texture and coursing is exempt from review. Any other proposal to replace the siding on a building requires review. Roof material. Roof material is about evenly divided between wood shingles and asphalt shingles. Fiber cement shingles that accurately replicate the appearance of wood shingles. Installing a roof of any other material requires review. Any resurfacing of a flat roof (slope of less than 3 in 12) is exempt from review. Gutters and leaders are exempt from review. The intent is to retain original doorways that contribute to the historic character of a building. Many of the front entrances have special treatment with sidelights, transoms or pediments and many retain the original front door. When a door is deteriorated and needs to be replaced, the Board will work with the home owner to find the best replacement at a reasonable cost. For any residence, installing an access to a door for the physically handicapped is exempt from review. The intent is to retain original windows that contribute to the historic character of a house, especially on the front facade. Many of the historic houses retain the original window sash which include the multi-pane and diamond-pane sash typical of the Shingle style. While most houses have plain window trim, special treatments such as pedimented windows, Palladian windows, large stair hall windows and eyebrow dormers give modest decorative emphasis to some houses. The original windows make a significant contribution to the architectural character and to the sense of authenticity of the historic district. Windows and their trim that contribute to the historic character of a house should be retained where reasonably feasible, as set forth below. For any request to replace window components the Architectural Review Board will consider the contribution the existing windows make to the historic character of the house. Replacement components for important windows, especially those on the front facade, should match the material, configuration and dimensions of the original. When a window is deteriorated and needs to be replaced, the Board will work with the home owner to find the best replacement at a reasonable cost. Storm windows, window screens and window shutters are exempt from review. The intent is to retain original porches that contribute to the historic character of a house. Thirteen of the fourteen historic cottages retain wide porches and many also have upper-story porches. Many of the porches have shingled posts and shingled balustrades or white classical columns, both typical of the Shingle style. These porches are another common element which gives the district such a cohesive quality. The porches also convey the relationship of the houses to their setting on the bluff overlooking the Atlantic. Retaining these porches is one of the most important factors in maintaining the character of the Bluff Road Historic District. Enclosing part of a porch with traditional divided-light storm panels can be an appropriate alteration. Repair or replacement-in-kind of porch steps, porch flooring and railings to porch steps are exempt from review. The natural shingle siding of the fourteen historic houses is an important unifying feature of the historic district. All fourteen historic houses have white trim. Historically a greater variety of trim colors were found on these houses. Trim color is not as important as the natural shingle siding in establishing the character of the district. Because the most important historic "finish" to maintain is the unpainted shingle siding, only proposals to paint or stain natural wood shingle siding will be subject to review. Any painting of an existing painted surface is exempt from review. Application of a clear wood preservative on wood shingle siding is exempt from review. Any proposal to paint or stain natural wood shingle siding requires review. Over the past century the cottages on Bluff Road have been enlarged with additions to rear or side walls that were designed to have a minimal effect on the form and integrity of the main house. The goal of the historic district is to continue this tradition of building additions that respect the character of the historic house. Additions and alterations are appropriate when they do not diminish the architectural integrity or the setting of a house in the district. It is not the intent of these guidelines to lessen the floor area that could be built under the zoning code, but to accommodate all reasonable plans to enlarge houses as allowed by zoning. Proposals to substantially enlarge some houses in the district are anticipated. Some proposals may include plans to relocate the house on the lot. The Architectural Review Board will work with the home owner to find the most reasonable balance between additions and relocation in order to achieve the expansion in a way that alters the architectural integrity of the house or the setting of the historic district as little as possible. Additions should not detract from the form and integrity of the historic house, especially as viewed from Bluff Road. Additions and alterations should not alter an important historic feature of a house and should be compatible with the historic house and with the character of the district in scale, massing, proportion and arrangement of windows and other openings, roof form, texture, materials and architectural details. No additions should be placed on the facade facing Bluff Road. Additions set back on the rear wall are encouraged. For some properties the configuration of the lot and the location of the historic house make a sizeable rear addition impractical. For these properties, flexibility is required in considering a side addition that is reasonably larger than would be the case where a rear addition is possible. Additions to a side wall are appropriate when they are secondary to the historic house. A side addition should be set back from the front wall of the historic house and be subordinate in size and scale to the historic house. Open and enclosed porches are traditional and appropriate additions to side walls. Flexibility is required in reviewing additions and alterations to rear walls and to secondary side walls of houses where installation of doors, windows, and additions with larger areas of glass than found in the historic house can be expected. The maximum width in feet times the maximum height in feet of the front elevation of a proposed side addition should be less than half the maximum width in feet times the maximum height in feet of the front elevation of the historic house. This guideline does not apply to properties, such as 266 Bluff Road, where the configuration of the lot and the location of the historic house make a sizeable rear addition impractical. The intent of review of these non-historic houses is to see that any changes do not detract from the setting of an historic house and do not diminish the character of the historic district. Therefore any proposed changes to a nonhistoric-house should be judged for their compatibility with neighboring historic houses and with the character of the Bluff Road Historic District. Because most work on a non-historic house would have little or no effect on the historic district, these guidelines attempt to make the process as streamlined as possible. Any work to a non-historic house which does not require a building permit is exempt from review. Any work requiring a building permit is subject to review and shall be judged by the Architectural Review Board using the principles of compatibility in § 255-7-60 of the East Hampton Town Code. 325 Bluff Road has a unique circumstance being set back approximately 900 south of Bluff Road. The Board will take into account the degree to which the proposed work will be visible from Bluff Road. Priority would be given to the compatibility of the most visible features of the proposed work. Any addition or alteration of a non-historic house may be in the style of that house. Existing garages and other outbuildings are in hack yards and most are set well back from the road and have very little impact on the setting of the Bluff Road Historic District. Any accessory building, such as a garage, shed or pool house, located in the "back yard" of a residence is exempt from review. Placement and plans for accessory buildings at any other location will be reviewed. Accessory buildings should be sited to the rear of the main building. If the configuration of a lot does not allow the structure to be placed in the back yard, the Board will consider the impact of the structure at the proposed location on the setting of the properties in the district. An accessory building should not be located in the front yard of any property in the district. Accessory buildings such as garages, sheds and pool houses should be compatible with the main building, its setting and with neighboring buildings. There is one vacant parcel at the midpoint of the string of historic houses on Bluff Road. A new residence here will affect the setting of the historic district. The six non-historic houses have the potential to be redeveloped. The design of new construction should respond to the architectural traditions and character of the Bluff Road Historic District as established by the historic houses. A new building should fit into the existing context while preserving the sense of evolution and the authenticity of the historic district. Particularly important is compatibility of siting, size, scale, height, massing and materials. Section 255-7-60B of the East Hampton Town Code provides criteria for judging the compatibility of new construction. These criteria, which are amplified below, define the basic design elements which establish the character of the historic district. The design elements of a new building should be in harmony with the same elements of the surrounding historic buildings. New buildings should be sited on the lots corresponding to the setbacks of neighboring historic houses. A new house should be sited in relation to the topography of the property following the example of the historic houses. The front facade of a new house should face Bluff Road. Rhythm of spacing of buildings. The rhythm of buildings and the spaces between which characterize the district should be maintained by the siting of a new house on its lot. Scale. The scale of a new house and its features should be in harmony with the scale of the historic houses in the district. Height. The height of a new house should be within the range of heights of the historic houses in the district. Massing. The historic houses are predominantly simple forms with some complexity given by a cross gable, a recessed porch or dormer windows. The composition of a new house should correspond to the restrained complex massing of the historic houses. The front facade and prominent side facades of new houses should have a ratio of door and window area to wall area similar to that of the historic residences. A porch would enhance the overall compatibility with the historic district. Roof form. New houses should have a roof form typical of that of surrounding historic houses. The historic houses have gable, gambrel or hip roofs with intersecting cross gables, eaves at different levels and dormer windows that give them a somewhat complex roofline. Materials. The materials of a new building should be in harmony with the materials of the historic residences, all of which have wood shingle siding and painted wood trim. Architectural details. The conservative use of decorative detail on new residences would enhance their compatibility with the historic houses in the district where the use of decorative elements is restrained. New work should also reflect the tradition of quality in materials and construction found in the details of the historic houses. No building or structure or portion thereof that makes an important contribution to the district should be demolished. Exceptions to this rule may be granted by the Architectural Review Board only as follows. If an application for demolition of an entire historic building is based on structural instability or deterioration, a technical report prepared by an architect or engineer is required. The report will detail the problems and provide cost estimates for their correction. The intent is to retain the historic buildings on their original sites. The houses on the level plateau at the east end of Bluff Road are each sited on their lot in a similar fashion. The regular rhythm of the houses and the spaces between them, along with the band of front lawns, are major features of the historic district. At the west end of Bluff Road the houses are perched at the top of the dune, a placement which contributes to the rural character of the road and to the relationship between these houses and the view to the Atlantic Ocean. With the careful siting on their lots, each historic house contributes to the setting of the neighboring houses and together they establish the larger setting of the historic district. In considering a proposal to relocate a building, the Architectural Review Board will consider the historic and architectural significance of the building, the contribution the building makes to the historic district on its existing site, and the impact of its relocation on the character of the district. Before approval can be granted to relocate a building, the Architectural Review Board shall require that plans for proposed new construction or other use of the site be submitted and approved. The nature of review for public property. Proposals for work to property owned by the Town of East Hampton will he submitted to the Architectural Review Board for their review. The Architectural Review Board will issue their findings in a report to the Town Board and to the official making the application. The report will explain how the proposal meets or does not meet the standards, criteria and guidelines that apply to the Bluff Road Historic District and will consider any alternatives to the proposal that would better meet those standards, criteria and guidelines. Bluff Road and public land. Bluff Road and adjoining public land should be managed in a way that maintains or enhances the setting of the historic district. Bluff Road and the double dune area owned by the Town of East Hampton are important components of the setting of the historic houses of the Bluff Road Historic District. The rural character of Bluff Road, the natural vegetation (especially the Eastern red cedar, bayberry and wild cherry) and the vista across the dunes to the Atlantic are all important features of the historic district. Early news show a much more open hedgerow on the south side of Bluff Road. This hedgerow has since become overgrown and now obscures much of the view from Bluff Road across the dunes to the ocean. Any proposal should maintain or enhance the setting of the residences in the district. The rural character of Bluff Road should be retained. The roadway should be maintained at its present width with no curbing. The setting of the historic district should be enhanced by restoring views from Bluff Road across the dunes to the ocean by selectively clearing and pruning vegetation within the road right-of-way. The district contains four public buildings associated with the Naval Direction-Finding Station which operated here from 1921 through World War II. This Station provided bearings for Naval and merchant vessels and was especially important during World War II when it intercepted transmissions from German ships and U-boats in the North Atlantic for the purpose of targeting their position for attacks by U.S. ships and planes. The Town Marine Museum was the barracks, built about 1942. The brick Donald W. Lamb Memorial Building was the transmitter building for the low-frequency direction-finding station, built about 1939. The concession stand at Atlantic Avenue Beach is on the foundation of the 1921 low-frequency direction-finding station and was rebuilt in 1984 to have the exterior form of the original. Behind the Marine Museum is the Station's guard house. These buildings are significant for their associations with maritime and military history and are important as components of the setting of the summer cottages on Bluff Road. Because of the attempt to camouflage these buildings by giving them a residential appearance they are compatible with the character of the historic district. The Marine Museum is especially compatible with the character of the district. Its simple gable-roofed form, entrance porch, windows with blinds, natural shingle siding and white trim give it a residential appearance in keeping with the character of the summer cottages. Because of its small size and residential character, the Donald W. Lamb Memorial Building has a minimal impact on the setting of the historic houses. The addition to the south is not visible from Bluff Road. The front lawns of these two buildings also contribute to the overall setting of the district. The contribution these buildings make to the historic district and their compatibility with the setting of the historic houses should be maintained. These properties should be maintained in a way that enhances their compatibility with the setting of the fourteen historic summer cottages. The original features of these buildings should be maintained. Any necessary addition to the Marine Museum or to the Donald W. Lamb Memorial Building should be located on the south side and should not be visible from Bluff Road. A second story should not be added to the Donald W. Lamb Memorial Building. Features of the property that contribute to the setting of the historic district should be maintained. The historic district contains approximately 100 aces of dune land which contribute to the setting of the summer cottages on Bluff Road. This intact natural setting maintains the relationship of the cottages to the Atlantic Ocean and recalls the wild and picturesque landscape that attracted the founders of Amagansett's summer colony. All of this land, with the exception of two parcels which contain residences, is owned by either the Town of East Hampton, the U.S. Fish and Wildlife Service, or The Nature Conservancy. The U.S. Fish and Wildlife Service parcel is designated the Amagansett National Wildlife Refuge and is included in a Parks and Conservation zoning district. Two parcels owned by the Town of East Hampton (172-11-18.1 and 172-11-20) are also in a Parks and Conservation zoning district. The two other parcels owned by the Town of East Hampton (190-2-16.1 and 190-2-17.2) and the eight parcels owned by The Nature Conservancy are included in an A2 Residence zoning district and are within The Atlantic Double Dunes Preserve. The goal of designating these parcels as the Amagansett National Wildlife Refuge, as a Parks and Conservation zoning district or as The Atlantic Double Dunes Preserve is to maintain the land in its natural state. The goal of the Bluff Road Historic District is to protect this natural landscape as the setting of the summer cottages. Any structure proposed to be placed on these properties is subject to review by the Architectural Review Board.